It’s been one week today, I haven’t been able to write about it till now. We lost another pet, yes another! This one hit us all pretty hard. Our old boxer Leroy. He had been with us for so long, it really has shocked us all. He has just always been there, and now he is not…. Always in the background, a constant presence in our lives. He was a survivor, not tough, just always surviving, against all odds. As a young dog he was rescued from dog fighters. He was used as a “bait dog”, the dog the fight dog is trained against. Usually a bait dog is severely beat and even deformed in some way. So that way it can not hurt the “fight dog”. Our Leroy had many of his teeth broken off. Other dogs have been blinded, or teeth fully removed. It’s horrible what is done by these kind of people. What was done to our Leroy! Many dogs who go through something like that, can never emotionally recover enough to be a pet. They have been to scarred to be successful anywhere. However, Leroy, although always leery of men, was a wonderful companion. He would run if a broom fell over, or with a startling noise. He never liked to see anyone hold any sort of stick. He would even secretly hide a set of plastic golf clubs under a bed, so toddlers couldn’t bang around on anything with them! As with many boxers Leroy suffered from tumors, and yes the external ones can be removed, however often there are internal ones doing more damage. In the case of Leroy, likely a brain tumor was putting pressure on the brain. At 2 a.m. On Memorial Day, he started having a grand mal seizure, after finding a vet who could be called in at that hour and day, he had been in and out of seizures for nearly 3 hours. Many, many doses of medication was administered to stop the seizure, with no success. After 4 hours of almost constant seizures, he was laid to rest. 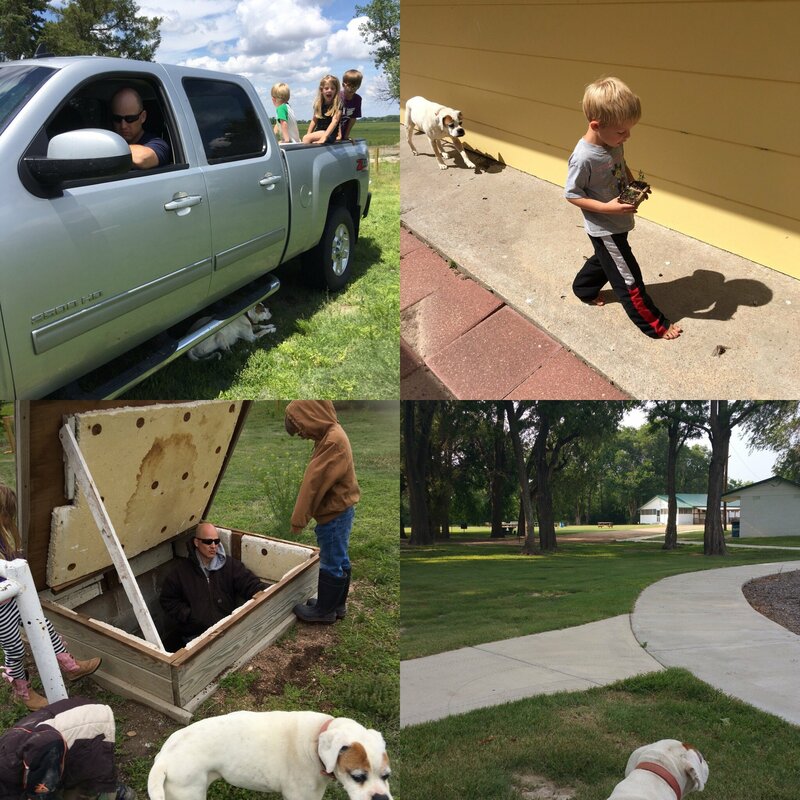 We returned home to bury him at a special place in the farm…. For many long days since, I have thought about everything. He had been through the toughest parts of my life with me. A divorce in an emotionally abusive relationship. A custody battle in a system where he with the most money usually wins (I was a broke single mother, he was a guy whose parents paid for everything) I was a emotionally broken human Leroy was an emotionally broken dog. We fit together perfectly. He moved nearly a dozen times with me. He accepted another man in our lives. He was there for 3 more children entering this world. Even though at the end I was a little to preoccupied to pay him much attention, he was there waiting to be loved on. Yes I have those thoughts of “I wish I would have”… Or “if I would have done this differently”… However he was a good dog he had a well loved life. He had people who loved him, kids who played with him, people who took him everywhere. It’s better to have loved and lost, than never to have loved at all..
Heart broken, and with a home that feels a little more empty, life goes on.